In my Introduction to Environmental Studies class, one of our first projects was about climate communication. In order to be a compelling environmental activist, we reasoned, you have to be able to start productive conversations with the vast majority of Americans, most of whom do not believe that climate change will affect them personally. Armed with talking points, we scripted conversations with people from our hometowns, practicing how to begin these hard conversations. Over spring break, inspired by this assignment, I decided to start a conversation with a family member about climate change. I prepared talking points as we had practiced in class. The conversation failed miserably, largely due to how I approached the conversation. 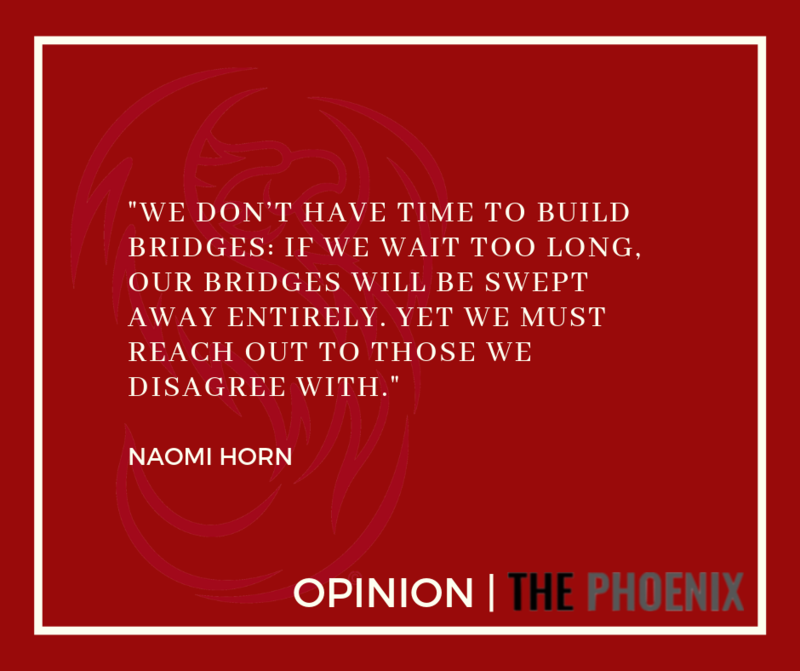 Unfortunately, I found myself falling into a trend that is far too common at Swarthmore and among similar communities — because I had spent so long in the Swat echo chamber, I lost sight of the fact that there are plenty of intelligent people who disagree with me. With urgent issues like climate change, we do not have time to refuse to engage with anyone. One of the hardest balances to strike when talking about issues like climate change is finding the line between activism and pluralism. Climate change is one of the most urgent issues facing humanity today: the most recent report from the Intergovernmental Panel on Climate Change lays out the need to curb global warming so that it does not surpass 1.5℃ to avoid catastrophic damages. Even limiting warming to 1.5℃ requires immediate action, and the effects to the climate are still intense within that range: increased instances of severe weather, rising ocean levels, and severe heat waves are imminent. The United States –– and most of the rest of the world –– is not taking the necessary action to prevent impending disaster. In light of this information, compromise with people who are not concerned with climate change is an absurd proposition. 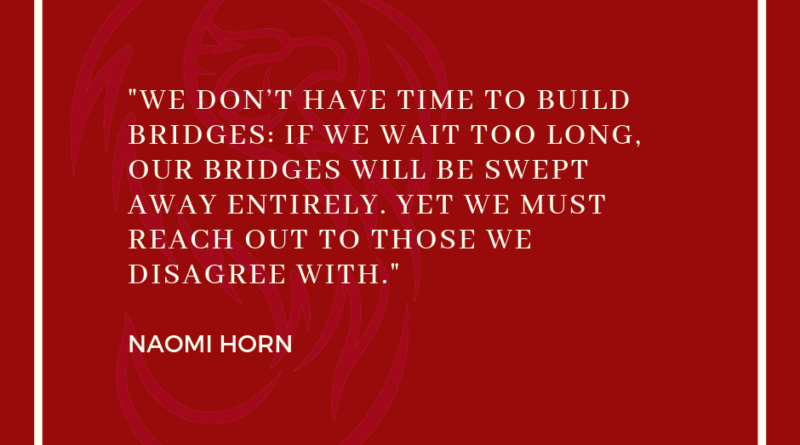 We don’t have time to build bridges: if we wait too long, our bridges will be swept away entirely. Yet we must reach out to those we disagree with. This is where we run into trouble: the knee jerk reaction for too many of us, myself included, is to assume the worst in people we disagree with. Frankly, it is more comfortable to make sweeping generalizations. If we believe that everyone who doesn’t see climate change as an urgent issue is a fundamentally bad person, we can write them off as a lost cause. The problem, however, is that we need these people not to be lost causes. Without the support of a critical majority, the likelihood of substantial systematic change is slim to none. If we assume the worst in those we disagree with, we erase the possibility of gaining them as allies. So here’s where I went wrong in my conversation over break: I began completely on guard, with a list of statistics aimed to refute any hint of skepticism. By starting the conversation as a debate, I fostered defensiveness instead of actual communication. Even worse, I erased the natural goodwill that comes along with the fact that I was having a conversation with someone I love and who loves me back. I could have leaned into that mutual love and respect, using it as a foundation upon which to foster curiosity and then share the information I have. Instead of being able to raise issues that felt personally important, I went on the attack. As a result, the conversation quickly fell apart. Understandably, the person I was talking to did not appreciate the way that I was hurling information at them and responded defensively. The next day, we were able to talk about the ways in which both of us had felt dismissed in the earlier conversation. By the end, we had both reached a place of openness that I wish I’d had from the beginning. I didn’t change anyone’s mind about the urgency of environmental issues, but I created space for understanding. In the long run, I think that will be far more important. It’s hard to assume the best in people who draw conclusions that are ultimately harmful, but the vast majority of people enter conversations about climate change with ideals that they believe are reasonable. That doesn’t mean that we need to throw up our hands and always agree to disagree! Agreeing to disagree is productive in some cases, but other times, there is urgent work that must be done. With climate change, our country has perhaps agreed to disagree too much. It is possible, however, to reframe the way that we try to persuade people. Obviously, in public discourse, our relationship to the people we disagree with is more fraught. As frustrating as it is, meaningful policy change involves working within our current political and economic systems. And within these systems, it is vital that we learn how to do the messy work of communicating with people we disagree with. Dramatic change requires idealism. Implementing idealistic goals, however, involves just as much listening as it does talking. There is no one quick fix to any of this. If there were, many climate issues would have been solved before any of us were even born. By accepting that there is no quick fix, we give ourselves space to create meaningful and long-lasting change. What does this look like? How do we build communities without compromising our ideals? Many business schools recommend that people go out of their way to find common ground when trying to change someone’s mind. This works in climate conversations, too. Even if people disagree about the details, most of us can agree on certain big ideas. Although there are disagreements surrounding solutions, nobody likes the idea of their children drinking polluted water. Places like these are useful starting places. Common ground fosters trust, which in turn allows for open-mindedness. This work is not easy, and it is not always as pretty and clear cut as I’d like. But that does not mean it isn’t worth trying, Ultimately, if we want to change policy, we have to influence public opinion. If I could redo that conversation from break, I wouldn’t go into it with my list of facts and figures. I wouldn’t go into it with pre-planned answers to what I expected to hear back. Instead, I would bring up a specific concern, ask questions, and share my own opinions. Only at that point do I think it would be worth sharing the information I have. I’m going to try again next time I go home. I am hopeful that going forward, investing in these relationships will help to create a better future.